White's group at the top needs a second eye and Black has to make it is difficult as possible for White, getting some profit in the process. White's push 1 and 3 is a great achievement, since White managed to connect in sente to a group that had been sacrificed. 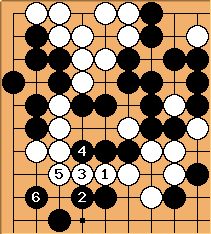 Black 2 does not allow White to move to the left side and Black 4 denies White an eye. Black 4 is slack. A bamboo joint was much better in this situation. If Black plays the bamboo joint here, White has to play one more move to connect. Then 6 denies White an eye and Black gets one more stone on the side for free. White jumps out with 5. I am a little bit uneasy about this move as the shape has aji; but White must try to run fast. Black 6 is a boshi that is an effective stopper, as a rule. White 7 seems too thin. The purpose is to run threatening black at the same time. Black 8 has a purpose: to strengthen the attacking stones. 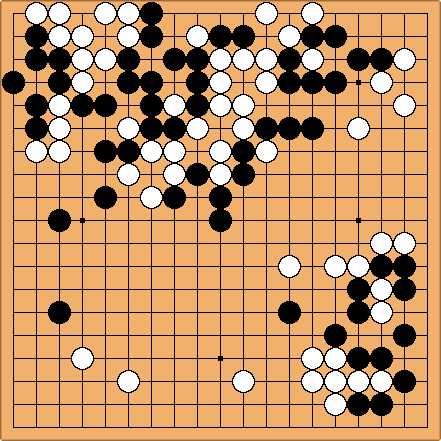 White plays tenuki at 9 threatening to exchage the corner for a group of black stones. Black 10 is a usual connection in the situations of this kind. This stone threatened to connect above.